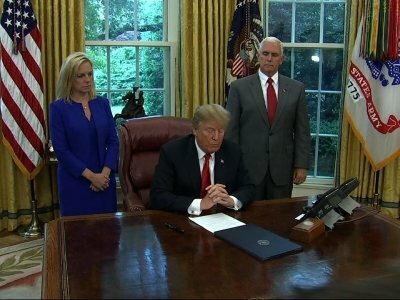 WASHINGTON (AP) — Bowing to pressure from anxious allies, President Donald Trump abruptly reversed himself Wednesday and signed an executive order halting his administration’s policy of separating children from their parents when they are detained illegally crossing the U.S. border. The order does not end the “zero-tolerance” policy that criminally prosecutes all adults caught crossing the border illegally. But, at least for the next few weeks, it would keep families together while they are in custody, expedite their cases and ask the Defense Department to help house them. It also doesn’t change anything yet for the some 2,300 children taken from their families since the policy was put into place. The news in recent days has been dominated by searing images of children held in cages at border facilities, as well as audio recordings of young children crying for their parents — images that have sparked fury, questions of morality and concern from Republicans about a negative impact on their races in November’s midterm elections.